What can you get from Pokémon Go gifts, and how do they work? 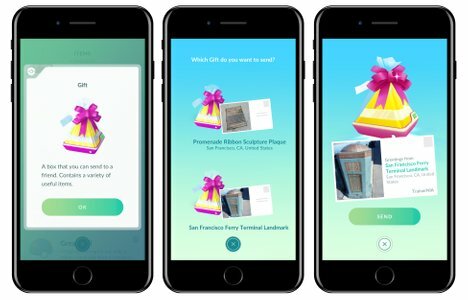 Gifts were recently introduced to Pokémon Go alongside the brand-new trading and friends list functionality. The gifts can be randomly acquired at any PokéStop in the world and are used to send friends on your list specific items that can include gift-exclusive prizes. These items, however, won't ever be sent to you and can only be given to other trainers. Sending gifts is easy and just requires you to register a friend on your Pokemon Go friends list by sharing codes with one another. You then simply select the friend you want to send the gift to by tapping on their name and choosing the "Send Gift" option. Depending on how many Gift Boxes you have, you can choose the one that you think will have the best stuff in it and send it over. But you won't know what you've sent until your friend opens it and tells you what items were inside. Gifts can have a multitude of items in them ranging from potions to Poké Balls. You'll always get a handful of items and could potentially get some rarer items if you're lucky. These gifts can include Hyper Potions, Max Potions, Revives, Max Revives, Poke Balls, Great Balls, Ultra Balls, Pinap Berries, and Evolution items. But the rarest and most unique item is the Alolan Pokemon Eggs. Each gift will come with three of the items listed above. If you only received two items, it means that the third was meant to be an Alolan Egg—but your egg bag was full, so there was no space for it. Always make sure that you have an empty egg space before opening a gift, just to be safe. What Pokémon can be in Alolan Eggs? Alolan Eggs are exclusive items in gifts and can house one of four Pokémon inside. These include Alolan Vulpix, Grimer, Meowth, and Sandshrew. To hatch the eggs, you'll need to incubate them like normal Pokémon Eggs and walk seven kilometers. Then you'll find out what's inside.